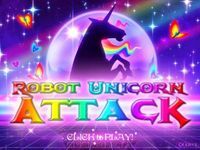 The goal of Adult Swim's ROBOT UNICORN ATTACK is to gallop, leap and dash through the sky in pursuit of your dreams, all to the tune of "Always" by Erasure. (Unicorns are big Erasure fans, and robot unicorns are no different.) Once the magic of ROBOT UNCORN ATTACK takes hold of your heart, you'll never want it to let go. Share your high scores with your Facebook friends, and make your dreams come true!